Remastered from the original stereo 1/4" tapes - LP feature expanded gatefold tip-on jacket and liner notes. 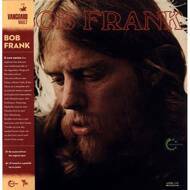 Originally released in 1972 on Vanguard Records, Bob Frank’s self titled debut album took elements of Dylan, Johnny Cash, and Ian Tyson and filtered it through a pot-smoked haze infused with Frank’s long-time friend, Memphis guru Jim Dickinson. Dickinson and Frank shared a mutual admiration that ran so deep that on Dickinson’s own 1972 debut album Dixie Fried (released on Atlantic Records) he recorded one of Bob’s songs, ‘Wild Bill Jones.’ Despite the Dickinson/Memphis connection, Bob Frank’s only LP for Vanguard has remained a forgotten, hard to find vinyl relic. Until now…. Carefully re-mastered from the original tapes, historical maverick (and noted expert on the Memphis scene) Alec Palao recently interviewed Frank in detail and assembled a lengthy essay for the CD and LP liner notes that detail Frank’s personal and musical journey.